Guernsey Girl and Vegetable Kabobs Recipe... Perfect for a weekend barbecue. Sweet dreams are made of cheese. These kabobs made with Upper Canada’s famous grilling cheese are heavenly. 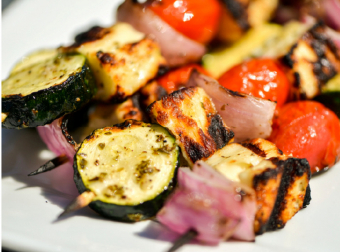 The gooey, buttery Guernsey Girl adds a decadent dimension to these veggie kabobs! veggies; make sure they are covered. Toss to combine and marinate for 10 minutes. Grill over medium heat until cheese caramelizes and veggies are softened and lightly browned, about 3 – 4 minutes per side. Brush with additional marinade.